This bag is a cyclist's solution for trips to the market, outdoor sporting events, a ride on a trail, or for a picnic in summer. Top-mounted insulated trunk bag for warm or cold items, with a Zippered lid and small easy-access top opening in case you are in a hurry. Just lift the Velcro lid and Pace your hand quickly and easily inside for a cold water bottle! 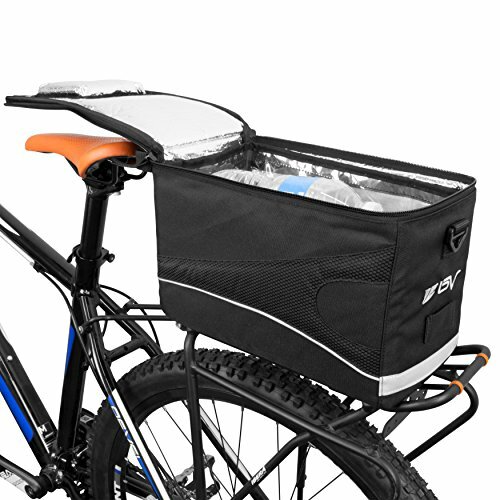 can be used for carrying groceries, snacks, food, hot or cold drinks, bike gear, and extra things you may want on your bike trip. Comes with a detachable shoulder Strap so you can take your bike cooler bag with you once you reach your destination! features: insulation keeps food and amp; drinks cool or warm. Eco-friendly (use instead of plastic shopping bags). water resistant, removable and washable bag liner. Contains a large insulated compartment with a quick-access lid. Includes a detachable shoulder Strap. Compatibility with ibera racks: ib-ra4, ib-ra5 and ib-ra15. Specifications: carrier attachment: three Velcro straps to attach onto bike rack (two for bottom of bag). Dimensions (L, w, H): 12 in x 6.75 in x 7.63 in (30.48 cm x 17.45 cm x 19.4 cm). capacity: 10.13 L (2.68 Gal). weight: 1.1 lbs (17.6 oz). compatibility: ibera racks: ib-ra4, ib-ra5 and ib-ra15. Item no. : BV-BA2.